Farmers and landowners who want to conserve pumping energy and water have many tools available to best match timing, volume and rate of irrigation to anticipated plant needs. Water applied in excess of plant needs and soil capacity or in places where plant roots can’t access it (either too deep in soil or laterally-distant from plant root zone) is both money lost and a potential liability in terms of runoff and erosion or leaching of nutrients beyond the plant root zone. Anyone can track regionally-specific weather and estimated evapotranspiration (plant water use) information on-line thanks to the state-wide network of California Irrigation Management Information System (CIMIS) weather and reference evapotranspiration stations. Soil-moisture monitoring devices and services provide even more site-specific water availability and plant-stress information accessible and in some cases calculate recommendations for irrigation timing and amount. University of California Cooperative Extension has established charts of different crops’ unique water needs based on plant growth stage and has developed on-line crop-specific tracking and guidance tools such as CropManage for both efficient irrigation and fertilizer applications. Many RCDs, water districts and private contractors around the state offer irrigation efficiency evaluation services for farmers and landscape managers to help them fine-tune their irrigation systems and management to make them as efficient as possible using the tools above. An irrigation efficiency evaluation should include an inspection of the entire irrigation system for functional issues (leaks, filters, constrictions), and measurement of water distribution uniformity. These help characterize the potential efficiency of a single irrigation, but efficient irrigation management requires tracking of multiple irrigations or an entire season of tracking water application relative to plant growth and production needs. Using guidance from such evaluations can enable an irrigation manager to save water and money and reduce the risks associated with excess runoff and leaching. 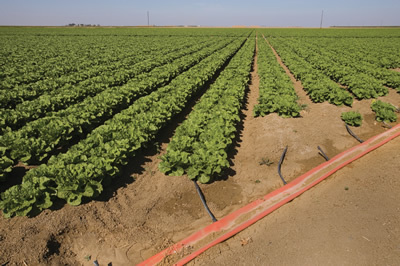 Any irrigation system can benefit from more efficient operation, but irrigators must also bear in mind salt-leaching requirements for plant health that require water application in addition to what is needed only for plant growth. Especially in a state with chronic water supply concerns, efficient water use is critical for stretching limited resources for the most benefit.